Hello! My name is Alex and I draw things. 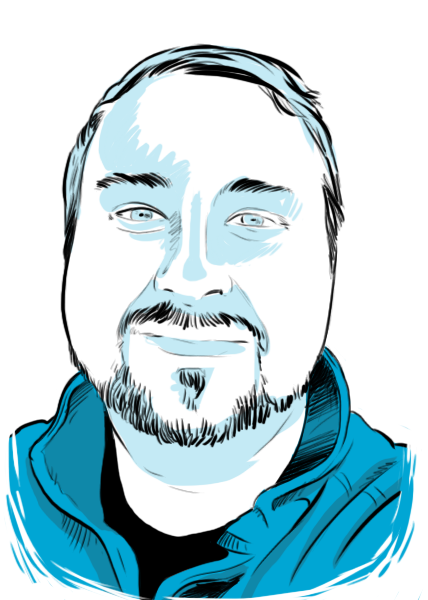 I work full-time from my home in Buffalo, New York as an Illustrator and Graphic Designer. My entire life revolves around being creative and creating artwork. I studied Illustration at The Fashion Institute of Technology in Manhattan. After school, I moved back to my beloved Buffalo. I worked several years in the printing industry as a Graphic Designer. It's here I honed my craft designing logos, brochures, stationary and more for customers. I never stopped doodling though, and soon discovered Shirt.Woot and their weekly t-shirt derby. By participating in the derby week after week for a couple of years a lot of things started happening for me. I learned about the t-shirt audience, practiced my craft and built a fan base. My work started printing on shirt-a-day websites and this whole thing started feeling like a viable business. By 2013 I had built a solid client base. I left the world of printing and have been my own boss ever since. I'm lucky enough to do what I love for a living every day. I still create a lot of t-shirts, but my illustrations have branched out to other things like books, comics, posters, merchandise and more. I like to think of myself as a hired gun of sorts for artwork. As we move into the future I have goals and dreams to fulfill with my artwork. I hope you stick around and follow my progress on social media. A world without art in it would be a bleak sad world.